After the ECROFI 22 conference (2013) the Cukuralan Au mine was visited. The opportunity was taken to collect samples for baro-acoustic decrepitation analysis to compare the fluid inclusion assemblages from this deposit with that of many other gold deposits shown elsewhere on this website. There are too few sample locations in this brief study to draw broad conclusions. However it is clear that baro-acoustic decrepitation can be applied to this type of deposit, although the mixed quartz and feldspar samples make interpretation difficult. There are several distinctly different decrepitation signatures which could assist in identifying different hydrothermal phases, most notably the barren quartz veins which seem to be a late stage overprint of the system. None of the samples had low temperature decrepitation which indicates that CO2 was absent or only a minor constituent of the hydrothermal fluid system. The Çukuralan Au deposit is in the Bergama (İzmir) region of western Turkey. The deposit is a low sulphidation epithermal deposit (similar to the Ovacık-Au deposit (40 km southeast of Çukuralan) occurring within the porphyritic dykes that cut the local metamorphic sequence known as Karakaya Complex. The gold grade varies between 0.5 and 50g/T, with mining from an open pit. Samples were collected from the unoxidized ore zone and also from the adjacent oxidized ore zone. At each sample location multiple sub-samples were collected within a few metres radius and these were analysed individually. Samples from the same location are plotted together on the following graphs. The samples were mostly of porphyry rather than quartz. An additional sample from a barren quartz vein in the footwall was collected from about 30 metres away. During sample preparation 2 samples (2219C and 2219D) were treated with dilute HCl to dissolve carbonates which were present. Only sub-sample 2219D was predominantly of quartz and the other sub-samples were of porphyry and also contained feldspar. 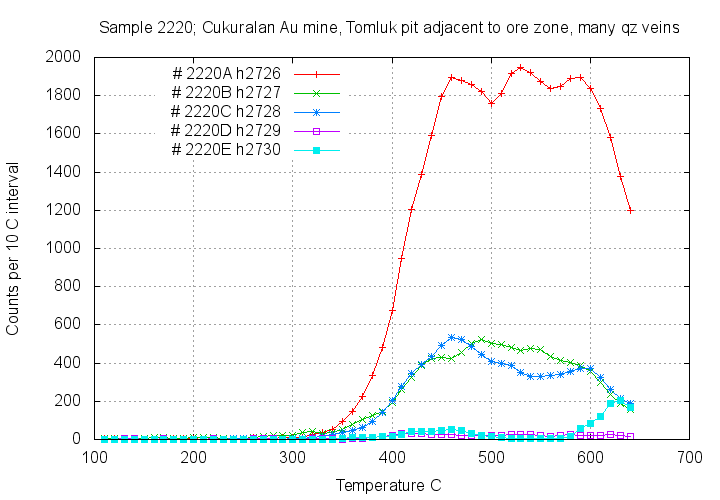 This mineral mixture has probably caused a complex decrepitation pattern and contributes to the unusually high decrepitation at 600 C on sub-samples 2219A, 2219B and 2219D. 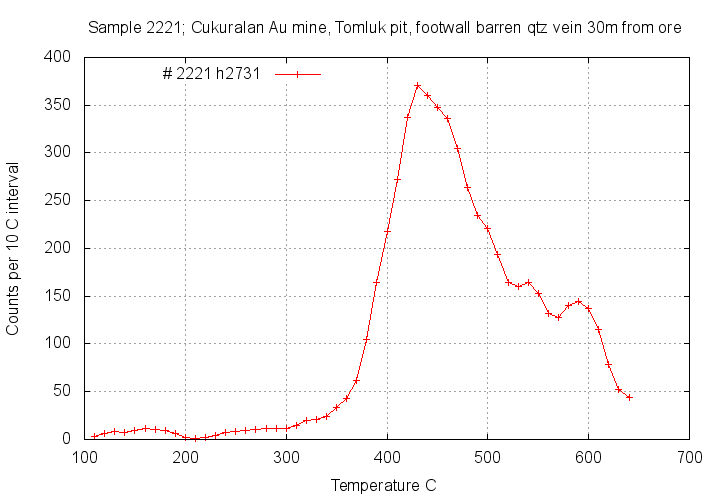 The lack of decrepitation below 350 C indicates that there was little or no CO2 in the hydrothermal fluids. Samples from the oxidized ore zone are not clearly different from those in the unoxidized ore zone and again they lack CO2. Sample 2220E was visually distinct and was of cherty silica rather than milky feldspar-silica. This sample had almost no decrepitation as is typical for chert. Sub-sample 2220D also had no decrepitation and is probably also chert. This quartz sample has similar character to the quartz sub-sample 2219D (above) from within the unoxidized ore zone. It suggests that the quartz veining may be a late stage barren overprint and that the gold mineralisation is part of a separate event, possibly more closely associated with the porphyry. There is no evidence of CO2 in this fluids in this sample. Many samples show broad decrepitation from 350 C to over 600 C, which is possibly because of the presence of both feldspar and quartz in the samples. The samples which were only of quartz (2219D and 2221) show decrepitation from 350 C to about 550 C. These quartz veins may be a late stage overprint on the mineralisation. 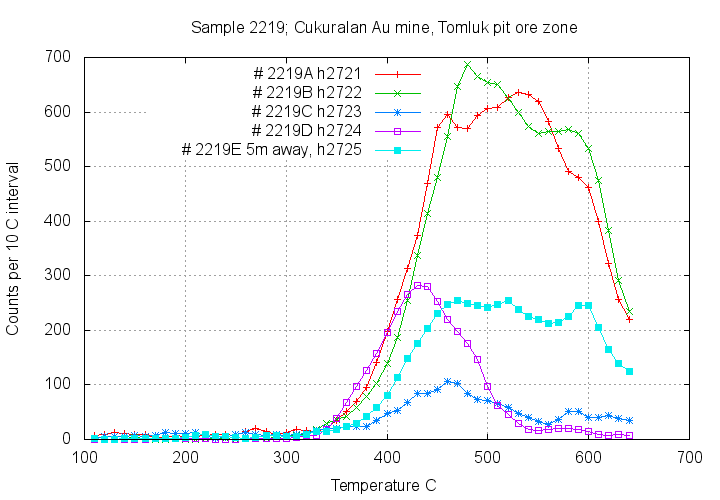 None of the samples shows a low temperature decrepitation peak (around 250 C to 350C) which is typical of CO2-rich fluids, and the hydrothermal fluids at Cukuralan seem to lack significant content of CO2. Sample 2220E was seen to be of chert and had almost no decrepitation, which is typical for chert samples. Sample 2220D also had no decrepitation and may also be a chert. There does not seem to be any significant difference between the unoxidized ore (sample 2219) and the oxidized ore (sample 2220) zones, which is as expected for a supergene oxidation event.